The RAM 280-F french fry dispenser dispenses french fries straight from the freezer to ensure they are cooked from frozen. This results in improved product quality, consistency and yield. The dual dispensing system enables the operator to fill two baskets simultaneously by sliding the baskets back into the fill position. An inductive basket sensor detects and delivers a portion-controlled load of fries into the baskets. Filled baskets are then removed and placed into a fryer for cooking. Operation of the RAM 280-F Frozen Fry Dispenser is easily controlled by a power switch, dual portion control keys and a series of menu functions located on the operator control panel. The LED control display is used for calibration, system diagnostics and to signal a system error has occurred. The dual series of portion control keys (left-side and right-side) are used to select the desired basket load weight and will flash to indicate to the crew that the hopper is empty. The RAM 280-F delivers the same dependable, efficient performance you’ve come to expect from the RAM line of fry dispensers. In addition, it is supported by our trained and certified local agents and our free technical phone support, which is available 24/7. 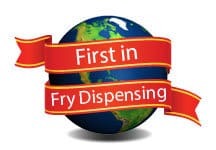 For more information about this quality french fry dispenser, contact Automated Equipment in Red Wing today.